If you’re seeking a mini-vacation, the Hound Hotel slot is what you’ll want to play. Be treated like a pampered pooch in this Microgaming slot that delivers fun, excitement, and lots of rewards. In addition to dashing wilds, a special bonus game gives you the opportunity to amplify your winning rewards. Welcome to the Hound Hotel slot review! Check into a game that knows how to provide you with a luxury escape. Powered by Microgaming, the Hound Hotel slot is a 25-payline and 5-reel slot that is not short on bonus features. Go wild with super stacked wilds, split wilds, expanding wilds, dashing wilds, and frozen wilds! This pampered dog-themed slot features cartoonish graphics that are colorful and playful. The images on the reels include J, Q, K, A symbols, as well as various pictures of finely dressed dogs, all of whom are hotel guests except for the bellboy. Behind the reels is the grand and lavish hotel that has clearly been designed to cater to the upper crust. 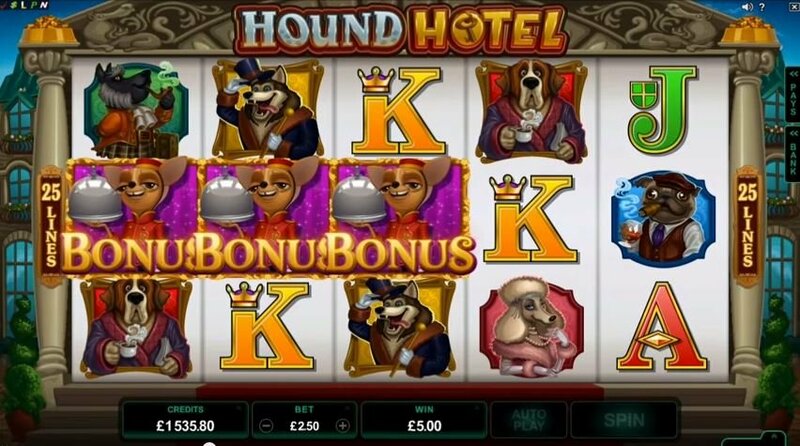 While similar to Microgaming’s Kitty Cabana, the Hound Hotel slot machine is more likely to appeal to dog lovers. The graphics are fun and bright. Images on the reels come to life when wins are rewarded, and the low-key but jazzy soundtrack that plays in the background will make you feel as though you’re hanging out in a hotel lobby as you play. 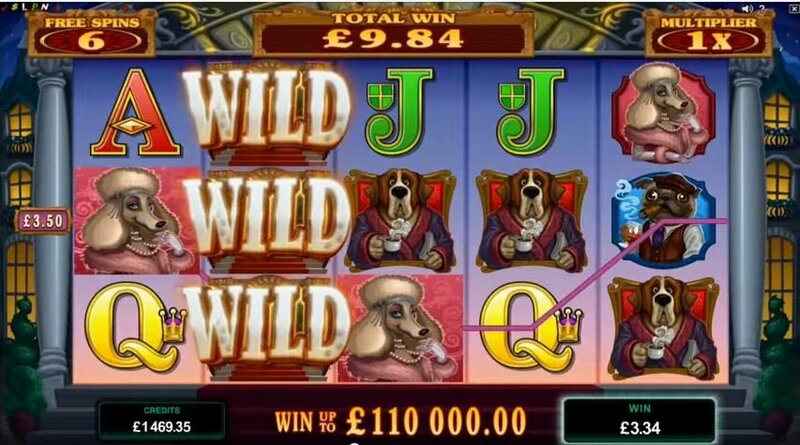 There are a few Hound Hotel slot bonuses, starting with the bonus that can be triggered in the base game. This is the Dashing Wilds feature and it is a feature that randomly occurs during a spin that does not result in a win. Three wilds will dash across the reels and latch themselves on to random reels, potentially increasing the chances of a win. The Hound Hotel bonus is a special bonus game feature that is triggered when 3 or more bellboy scatter symbols are landed on any of the reels. When the bonus game is activated, you will have the chance to unlock wilds, free spins, and multipliers to score a big win. You will be required to pick three doors, one on each of the three floors. Each door leads to different rewards. The first floor is where you will select your wild feature. 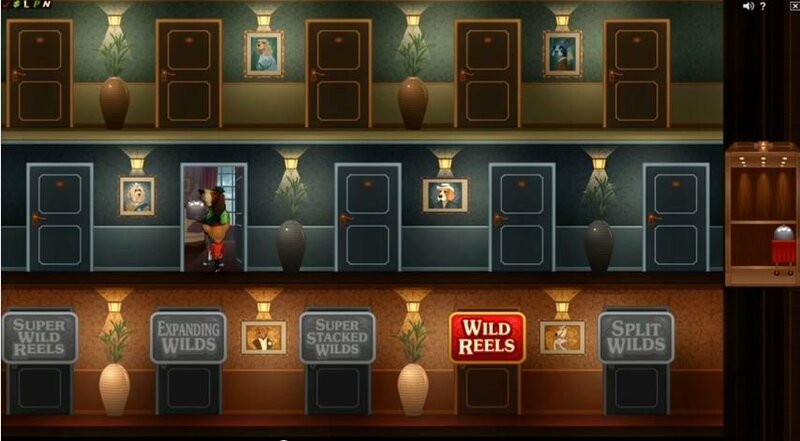 There are several wild possibilities that you can unlock, such as wilds that split into two to create additional winning potential, expanding wilds, stacked wilds of 20 positions on reels 2 and 4, frozen wilds on reels 1 and 5, and, finally, reels 2, 3, or 4 are wild on each spin. From there, choosing a door on the second level will determine the multiplier you will receive, while the doors on the third floor will determine the number of free spins you are awarded in the Hound Hotel game.